(CNS): While the administrative arm of government faces a rocky time regarding the recent revelations in the prison service, the immigration service and the Royal Cayman Islands Police Service, one enforcement agency in government is celebrating. 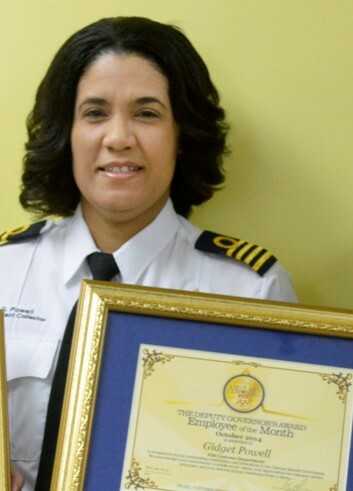 Assistant Collector of Customs Gidget Powell was named Employee of the Month for October and the latest civil servant to receive one of the deputy governor’s motivational gongs. She was described as the model civil servant of more than 26 years “professional, proficient, knowledgeable, courteous and compassionate.” An airport Manager for Customs on Grand Cayman, she is on-call and available for work 24/7. As a manager her staff said she consistently leads by example and encourages them to better themselves. Officials said she had an innate pride in her department and superb work ethic, and her superiors routinely receive spontaneous accolades from the public and other government agencies on her work. Presenting Powell with the award, Franz Manderson, the Deputy Governor, lauded her high calibre of professionalism and the leadership qualities that she displays in all aspects of her work life. He also praised her for steadfastly upholding the department’s mission, which is to collect and protect revenue, facilitate passengers and legitimate trade, as well as to maintain effective border security. Powell surprised by the gong said she was grateful to all who thought she deserved it. “This has certainly encouraged me to redouble my efforts in the service of my department, my colleagues, and the Cayman Islands Government as a whole,” she said. I used to be in the Import bussiness for more than a decade, some years ago. Always found Ms. Powell to be very professional and pleasant to deal with! Congrats where due! Ms. Powell deserves this recognition. Another excellent Civil Servant. The service has so many superstars- many that we have forgotten about. This award programme is a really good way to expose the talent and dedication we have in the Civil Service. Powell family very proud of you. You are a Leader!